This is a full transcription of the narrative of the Waterloo campaign by Private Matthew Clay 2nd Battalion 3rd [Scots Fusilier] Foot Guards, published in Bedford in 1853. This particular memoir is perhaps well known as it is often quoted in general histories of this most famous of battles, but rather surprisingly is virtually never seen in its full unadulterated form, as it has rarely been reprinted and is thus extremely scarce. Indeed I had to refer to the British Library to obtain a copy of the original work (British Library catalogue no. W2-4640) who were then kind enough to grant me permission to publish the same. I chose to publish this narrative simply because it is so rare and having sought a copy for so long I wanted fellow students of the battle to be able to obtain ready access to it. Much of the text will not be new to the reader, as it has been quoted ad infinitum by historians when referring to the Battle of Waterloo. 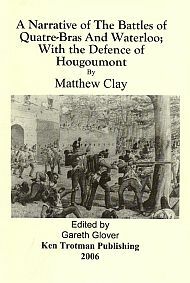 However, a closer examination of the complete text does produce some small nuances in our understanding of those three fateful days and one completely new and significant incident in that heroic defence of the chateau and farm complex called Hougoumont. Reading the text with great care I have come to the conclusion that at some stage Clay’s account has been misquoted and this original error has been perpetuated by those following, probably because they have not referred to the original text. There is clear evidence that two incidents have been mistakenly moulded into one; namely the famous ‘Closing of the Gates’. 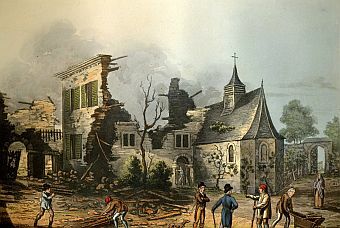 This means that in fact that there were two separate break-ins by the French, either of which if successful could have dramaticaly altered the outcome of the battle. This very serious incident appears to have been overlooked by historians; Clay’s narrative is generally regarded as safe and is freely quoted; I therefore await the learned debate which this discovery should engender with great interest.